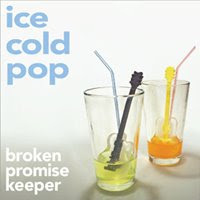 Upon first listen of Broken Promise Keeper's Ice Cold Pop, it hit me instantly - this guy, dubbed Rob Stuart at birth, is a fan. His love for powerpop radiates from every hook, harmony, and guitar jangle giving the album a sense a pureness rarely found elsewhere. BPK's ultimate goal is to write that sublimely perfect powerpop song, a candy-coated sonic grenade that will make you turn it up and sing along. His heart is in it and you feel every beat. What kept me listening, though, was his wit. I couldn't help but smile all through Once, a song ripe in over-the-top clichés yet self-aware enough to recognize their power (never mind that it eerily reminds me of the never-to-be-recorded-or-released Too Poppy classic Summer Cliché - kindred spirits). And the requisite song-about-girls Kristine taps into the universal reason why so many guys like Stuart get into pop music in the first place - chicks, man. And the music is just right - tight enough to be professional yet loose enough to be fun. To think this was just recorded in February. Impressive. This is required listening in the powerpop universe.